The best nesting sites in your garden are the ones that the birds build themself. Even with hole breeders, the nest sites that they keep returning to are the ones that they have excavated themselves in trees. These also last much longer and require no maintenance from us. Unfortunately these sites are often scarce and widely spread over a number of gardens and we would ideally like to attract the birds to breed in our gardens. In this we are fortunate that many birds are very willing to use nesting sites that we provide. The most popular nesting log must be the sisal logs that one purchases at pet shops or nurseries. These work very well for a season or two, but I find that they do not last long. Breeding birds have a tendency to constantly pick at the nest site and so, in time, bore through the top or bottom of the log. If this has happened the log can be discarded. One way to prevent this is to secure pieces of wood, cut to the same size, at the two ends of the log, this will make it last longer, but in due time they will make some holes around it or in the side. 34mm wood drill to hollow the log out from the top by making over lapping drill holes, and then chiselling out some of the surrounding wood. This leaves a fairy rough hole, but the birds will do some further excavation and smooth it out. I then cut the entry hole with a hole saw and screw and glue a piece of pine wood on to the top to seal the log. The other method is to cut the log lengthwise and hollow out the two halves. Doing this you should leave enough space around the edges to put in dowel plugs so that the two halves can be glued tight without any openings. Once gain use a hole saw to cut the entrance hole. It is important to look at the hole size that you make as it limits which birds can use it, but this need to be in relation to the nesting box. For smaller birds you need a box of about 80 x 80 x 25o mm and a hole size of 34 to 40 mm. For larger birds like Crested Barbets, Starlings and Wood-hoopoes it should be about 100 x 100 x 400 and a hole size of around 60 mm. I recommend that you put up houses with a variety of sizes so that you get a greater diversity of species. For African Hoopoe rather make a narrow slit of about 7cm as they prefer a tight and narrow opening. In placing the logs and nest boxes I have had many recommendations on which way they need to face, that they need to be at an angle , and so forth. All the holes that I have seen made in trees has always been pretty straight up, at most a few degrees slant to them. I have had successful logs facing the sun and facing away from the sun. The few unsuccessful one that I have had taught me one thing, and that is that the hole must not face in the predominant rain direction. In Johannesburg we mostly get our rain from the south east, and as such I will have no nests facing in that direction. The nesting log or house need to be between 2 and 4 meters off the ground and in a quiet corner but not obscured by dense foliage. Owl boxes have become very popular in suburban areas and there are a number of organisations that will install and service the boxes for you. I am not going into the designs of these boxes are they are well documented. I will rather touch on the practicalities of these boxes. One should be aware that when setting one up that it should not be in a busy area of the garden. Owls are fiercely protective of their nesting site and will go so far as attacking people that approach to closely, giving them a good knock or at worst some nasty talon scrapes, usually on the head. The site can also become messy and smelly with left over prey and regurgitated hair and bone pellets. Take note, if you can, of owl boxes in your area, they are often easy to spot in large trees as you drive through your suburb. If there is an occupied one somewhere within your suburb, the chance of you attracting a pair to your box is very slim. Until birds have laid eggs they do not have a strong attachment with a nest site, and could easily leave the nest if disturbed. When you see a bird building a nest or starting to show an interest in a nesting log, rather observe the birds from a distance and as unobtrusively as possible. Birds are very perceptive of being watched and constantly looking at a nest, even from a distance, could be construed as a potential enemy sussing out their nest. The easiest way to attract birds to you garden is by providing food. This is a temporary attraction as the birds come to feed and then leave again. This is also a seasonal attraction. In winter time you will attract more birds, but as many plants bear fruit in the summer months your offering may remain untouched. So how do you get the birds to stay? We have touched on providing nesting sites as well as planting trees and shrubs that provide safe havens and secure nesting sites. How do species who build their own nests? As the birds nest is the key foundation for their procreation it is very important to provide the elements that would assist them in creating this nest but also provide the needs for breeding successfully. The three key requirements required to breed successfully are sufficient food sources, a secure nest site, and quality nesting material in close proximity to the nest site. The former two we already provide, but now we need to provide them with the material to build the nest. The first way we can provide is by what we plant in our gardens. That grassland meadow that we previously discussed now plays a double role. The seeds it produces become the food source, but the grass itself becomes a very good source of nesting material. During summer the thin green leaves are a favourite of weavers, descending on your grassland to collect a strand at a time to be woven into the nest. We often think they destroy the grass with the amount they collect, but as with our lawns, the more we mow, the denser it becomes, the wild grass will also grow denser in response to this harvesting. Most of us gardeners want to keep our gardens neat, and this becomes a catch-22 in providing nesting material. Our grassland will dry out over the dry period of the year, and we then want to cut it down with the weed-eater, rake it clean and dispose of the grass. I do cut down most of it, but always leave a clump still standing and lightly rake the rest up. By the end of winter the dry grass becomes the best nesting material for Cape Robin-chats, Bulbuls, Sparrows and some sunbirds. Put the rest back into your borders to cover frost sensitive plants for winter and it also makes fantastic mulch, saving water and providing a compost base, which feeds your plants and feeds your birds through the insects that break this down. The same applies for the leaves you rake up in autumn, use this as a frost cover and mulch. If there are twigs and sticks in there, add them to the borders as well, not only will they in time become compost, but come breeding season many birds, especially doves, will collect them and use them to build their nests. Palm trees are also good providers of nesting material, and although I am not a fan of the Wasingtonia Palm by virtue of not being indigenous, they provide well to weavers without much apparent damage. Many gardeners complain about the damage that weavers do to their palms, but palms recover quickly and the period that they intensively harvest only last about a month or so. 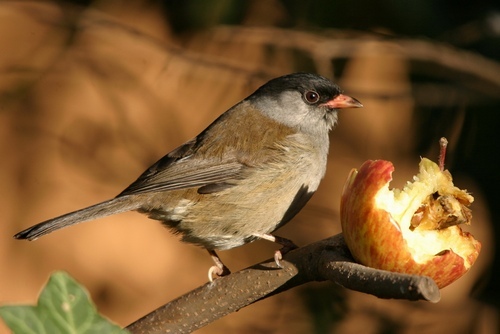 Those of us with smaller gardens or those who would want to provide more material could place Hessian snippets or coir (hair of coconut husks) in the fork of a tree, or other sheltered places where the birds can come and take pieces for their nests. These materials are natural and will biodegrade over time. Please try and avoid material that will impact on the environment. Spun wool takes a long time to decompose and the dyes are also not something you would want to add to the environment. By doing as many of the things that you can, that I have discussed here, you will be able to attract more birds to your garden and find more enjoyment from watching birds from home. The transformation will take some time as the birds will have to discover the changes. These suggestions will not suddenly attract all the birds that I have mentioned, but will give more motivation to the species in your immediate area to spend much more time on your garden. And who knows, you might just find some unexpected bird that drops by for a visit. I have. Should you have any questions or you require some advice please contact me. Yes, the sisal nesting boxes don’t last long. Here’s what I did to repair mine which had a small hole at the bottom and a 40cm split along its length about 1cm wide. I closed those openings with silicon sealer and glued an old grinding disc to the base. While still wet I parted dry potting soil into the silicon on the slit. It looks great! And the crested barbets moved in within 24-48 hours. All happy. Sorry to sound really ignorant! 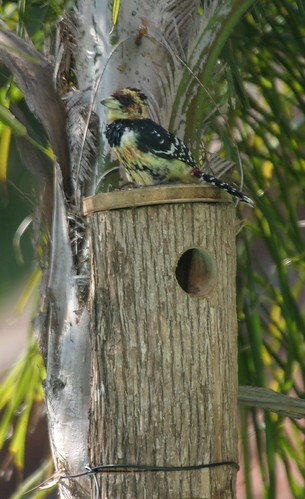 I’ve had great success with the Crested Barbets and sysal logs over many years. Put a new one up just a few hours ago and they’re already busy, but going in from the top again. Where is the “designated hole” supposed to be? Top or bottom? Pat, neither of the two. The hole should be on the side around 10-15 cm from the top. If they are going in from the top or bottom it is best to put a piece of wood over it, or the good advice from someone else to attach an old grinding disk. I live near Durban, about 2,5 km’s from the beach. Which nesting houses could I add to the garden? We had a red headed woodpecker nesting in the neighbor’s yard in an old tree but due to a recent storm the tree blew down. Unfortunately I couldn’t cut the nests out and hang them from new trees as it was relatively smashed and I pried the possible nests open to assist any hatch-lings or eggs, fortunately I didn’t find anything. Please advise as I am too busy to maintain an aviary at the moment but would love to see birds thriving in my garden. This unfortunately is not that easy, as areas differ. We in Johannesburg mostly get our storms from the Western side (either South-West or North-west ) But the slant of the rain is usually more South to South-east. I would think that Pretoria is not that much different as we are often under the same storm cells. To really know you will have to observe the rain in your area. From where the rain approaches you area is not that important, what is important is angle and direction that the rain actually falls from. I have just started with a sisal log and need to know 2 things. 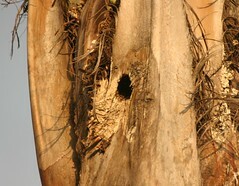 Do nesting logs for barbets need to be upright at a slight angle, as I’ve been told? and Do you need to excavate a hole ever so slightly to encourage them, or leave it entirely up to them? please check my frequently asked question on nesting logs. the last two questions deal with this. How can i get rid of indian mynah birds. They seem to be growing in numbers in our suburb. We have two sisal nesting logs in our garden, one at the back and one in the front. Last year they attached the parents and killed the baby barbets at the one in the back garden. Both sets of barbets left our garden. 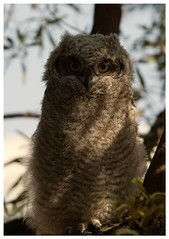 They chase and intimidate all the birds that come to feed and drink in our garden.